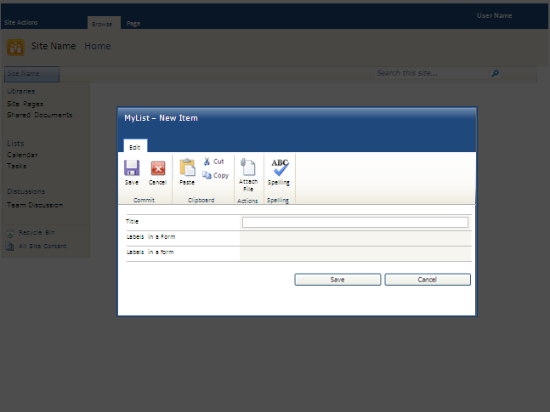 In SharePoint 2010 it is easy to create custom color themes to jazz up a site. 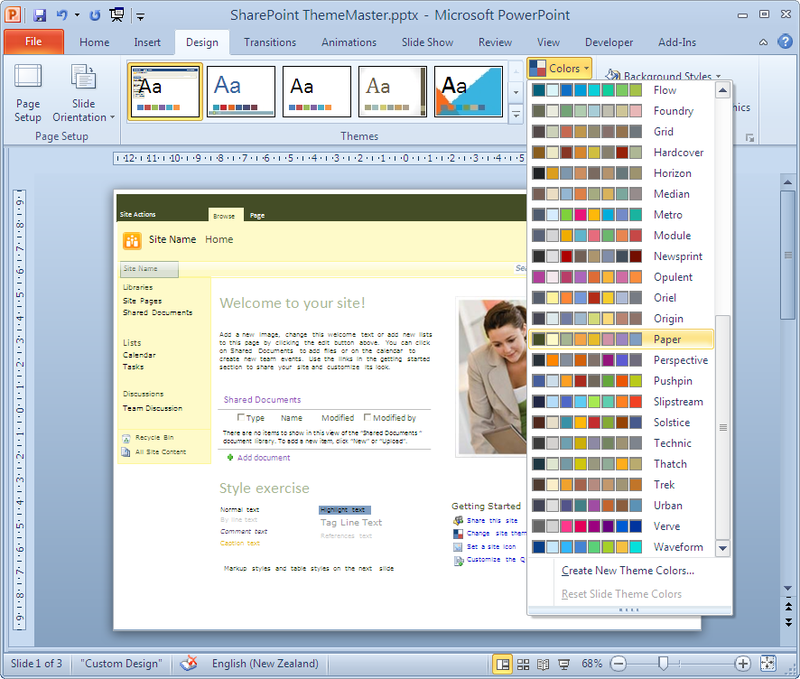 Theme colors can also be created in PowerPoint 2010 with a few clicks. But how do the chosen colors actually look in the SharePoint site? The attached PowerPoint has a preview of all the main elements of a SharePoint 2010 site with the selected color theme. Using Office Themes for SharePoint 2010 sites is easy, but can be time consuming. You need to create new theme colors in PowerPoint, save the file as an Office Theme with the .thmx extension, upload that theme to your SharePoint site collection gallery, and select it in the site via Site Settings > Site Theme. All in all, there is a lot of trial and error involved when testing theme colors, and doing the trial and error in SharePoint is just too slow. To add a little bit of confusion, the order of the theme colors in the color palettes is slightly different. In the SharePoint Site Theme dialog, the first four colors (for light and dark text/background) are listed in the order Dark 1, Light 1, Dark 2, Light 2. In the PowerPoint palette, the order is Light 1, Dark 1, Light 2, Dark 2. The following screenshot shows the color palettes side by side. Since I will be creating a lot of sites in the next few months, I was not looking forward to the time and effort involved in creating good-looking site themes. So I spent a little time re-creating the elements of a typical SharePoint Team site in PowerPoint 2010. The deck consists of three slides. Slide 1 shows the typical Home page of a Team Site, with the major HTML styles added to the page. Slide 2 has the Markup styles and two table layouts. Slide 3 shows a List form in edit mode, with the ribbon and the color background that will be applied to the data fields area of the form. Every element on these slides is formatted with same theme colors and shades that SharePoint uses. On any of these slides, you can click the Design ribbon and scroll through the Colors drop-down in the Themes panel. As you hover the mouse over a color theme, all slides in the deck will instantly change their appearance, even the muted colors behind the List form. Much, much faster than the SharePoint preview. The colors for the links below the Getting Started heading on the home page are hard coded and will not change with any theme. The SharePoint callout styles 1 through 4 are also hard coded and are not affected by themes, so I did not include them in the slide deck. The PowerPoint deck deals with theme colors only. It does not take into account theme fonts. PowerPoint seems to “forget” some color settings. It should always apply the second shading of the Light 1 color to the first row of the medium two tone table style, but if the Light 1 color is set to a dark color, PowerPoint applies a different shade, and when checking the theme color for the element, it no longer sits on the second shading of that color. Go figure. It may be tempting to apply different colors to the elements on the PowerPoint slide directly. Don’t. It will not have the desired effect when the color theme is used in SharePoint. And finally, sometimes the colors of a new theme are not applied correctly to a slide that did not have focus when the theme colors were changed. In that case, bring that slide into focus and toggle the theme colors again. Click File > New > New from existing > select the downloaded PowerPoint template. This will open a new presentation based on the template, so you can make changes to the presentation without affecting the original template. Click Design > Colors dropdown as shown in the screenshot above. Select from the offered Theme colors or create your own combination using the command at the bottom of the color list. Once you’re happy with the colors, use File > Save As. In the Save as type drop-down select Office Theme, enter a file name and click Save. This will create a file with the .thmx extension. In the site, use Site Actions > Site Settings > Themes and select the newly uploaded theme. This article was first published in October 2011 at www.experts-exchange.com.